Word for the day on this hike is "moist?. As dry as the state has been the southwest area got a bit of rain Friday night. The result was some water in the upper Cossatot River and Caney Creek...but also a very humid morning with wet vegetation in the woods. This was a welcome change. The morning stayed cloudy with an occasional light rain and temps around 80 or so...not sure. The sun began to show itself at noon. 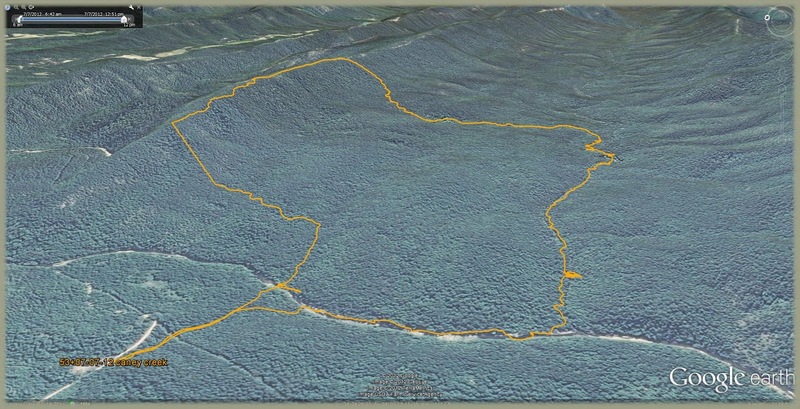 Now that the mood for the day is set...let's take a hike in the Caney Creek Wilderness area. 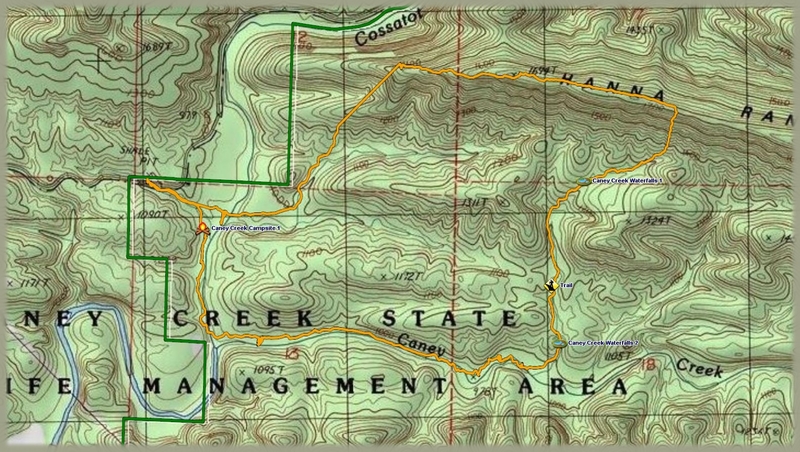 My experience with the Caney Creek Wilderness Area consists of a hike in from the eastern trailhead in the early 80's and a short hike in on the Buckeye Trail a couple of years ago. Why I have not explored it more is unclear to me. The Little Missouri and Cossatot areas have been friends of mine for 30 years. It was time to get in and see what was avilable here. Entrance was made where a corner of the wilderness touches CR 31 for a brief moment. There was a small clearing here good for parking but it did not appear to be a regularly used parking area. I was surprised to find a trail heading in from here so it was utilized for a stretch. I guess this is a spur connecting the main trail. The Cossatot appeared in a third of a mile from the start and it had some water in it from the rain the night before. It was easily forded without boot removal and the trail was followed for another fifth of a mile before I exited and moved in the direction of the Hanna Range. This is a strange name for this 3.5 mile long ridge that spans the area between East Hanna and West Hanna Mountains. My curiosty was aroused by this ridge so only one way to find out...git on up. My hope was to find some rocky outcrops that would provide views to the north and south....but nooooo...this was not the case. The top of this ridge line is a mess of prickly plants and low growing brush that make progress a slow endeavor. I can count at least five varieties of plants armed with thorns. There were occasional rocky spots but none with great views. There were some cool meadow areas with tall grass along the way. After a time the decision was made to reduce elevation and make for the valley. An unnamed creek was followed and many dry waterfalls were begging for liquid to flow over their sides. At lower levels springs continue to feed this creek for many small fish and lush grasses and ferns lined the banks. I eventually crossed the Caney Creek Trail but forsook it for the main creek below. Caney Creek is is a lovely specimen with peaceful pools and occasional mini rapids. The trees and other plants in this wilderness maintained a lushness even with the dry conditions we have endured for the last 2 months. A point worth noting was the abundance of orange dangly things scattered above the creek. I would like to thank whoever enhanced my wilderness experience by hanging orange ribbons just above the creek at numerous locations. I guess the creek was easily lost along the way and needed to be pointed out to someone. The creek was followed to the confluence with the Cossatot where a right turn was made back in the direction of my origin. The river here is neat with small rapids very much like those on the lower stretches within the State Park. I crossed at a rocky spot and reconnected to the trail that began my short journey. By now the sun was warming the air and the humidity was boosted...but it felt good. Only 3 crawling ticks were counted...and a few chiggers. It was so humid that I had to remove my glasses due to fogging. Because of this my glasses were lost along the way and I was forced to view the forest in a less than optimal fashion. Luckily my vision is not so bad that maneuvering was still possible. Spider web facials were a major joy on this hike. Gnats were not too bad and no snakes were seen. One note of amazement was the lack of poison ivy encountered...very sparse for some reason. Total miles about 5.5. I like this wilderness and will be back for more. The hike ended around 1:00 p.m. ...and back to Little Rock by 4:00.